It should be noted that unlike short-period Comets Halley and 67P/G-C (Rosetta target) which are short period Comets (75 years and 7 years respectively), Comet Siding Spring is a long-period comet – just as was Comet ISON last year. Although it is generally accepted that these long-period comets have very long orbit periods (>100,000 years) and come in from the Oort Cloud, our hypothesis includes the proposition that many such comets are effectively parabolic and are “sling shot in” towards our solar system from nearby stars. The Hoyle-Wickramasinghe Panspermia Model of the Panspermia Hypothesis predicts that the short period comets and even some asteroids orbiting the sun are carriers of “solar system life” including the RNA/DNA that we find in within living cells in every nook and cranny of earth, and that we are now finding in the stratosphere; inside meteorites; and even outside the windows of the International Space Station. With the overwhelming dominance of viruses in our terrestrial biosphere, viruses are also most likely included in the cosmic cargo being transported in these objects. Within just a few years we expect to confirm that microbial life across the solar system, from deep under the ice and rock of Mars, to under the ice of Europa and Enceladus is largely the same – with viruses, bacteria and archaea largely “similar” as solar system life has been homogenized over the last 4.5 billion years (4.5 bya). But what about life in other solar systems and across the galaxy? We have recently published a paper at http://www.hypothesisjournal.org which calculates the time to seed the galaxy from a single point source which was likely NOT Earth. Included in this “thought experiment”, is the assumption that “the seeds of life”, are carried from star to star by the long-period comets like ISON and SIDING SPRING. Many years ago I concluded that “Life is a Cosmic Phenomenon”, so I wait with baited breath the results of MAVEN’s observations this coming Saturday. I have written that the inside of long-period comets should be ideal places to incubate evolving viruses and bacteria. Then again it could simply house dormant viruses or DNA pieces or even prions with no associated cells (ie no bacteria or archaea) to cause activation. Now we have a chance to point sophisticated instruments at both Mars and at this long-period comet approaching the red planet. It is for me a breath-taking moment. 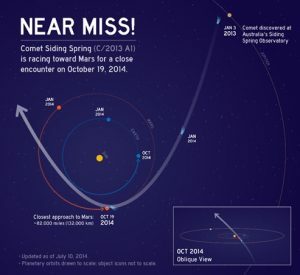 Well, little did Sir Arthur or any of us, know just 13 years ago, that on October 19th, 2014 we would have a long-period comet (way more significant than Halley’s Comet), Comet Siding Spring, pass close to Mars just when NASA had positioned an amazing set of scientific instruments in orbit around Mars (The MAVEN Mission). These instruments will point to Comet Siding Spring in just a few days. 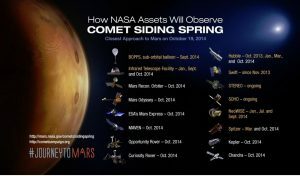 The same experiments planned to run on the upper atmosphere of Mars, by serendipity of timing, can now be pointed and run on a long-period comet. The hope is that amino acids will eventually be detected outside our Solar System. “That’s what everyone would like to see,” said Prof Griffin. “If amino acids are widespread throughout the galaxy, life may be also”. “So far we do not have the sensitivity to detect the signals from [amino acids]… in the interstellar medium,” explained Dr Belloche. “The interstellar chemistry seems to be able to form these amino acids but at the moment we lack the evidence. After years of using remote spectroscopy looking into the Inter-Stellar Medium (ISM) from earth 27,000 light years distance, we now have an amazing close-up opportunity to analyze a Comet. 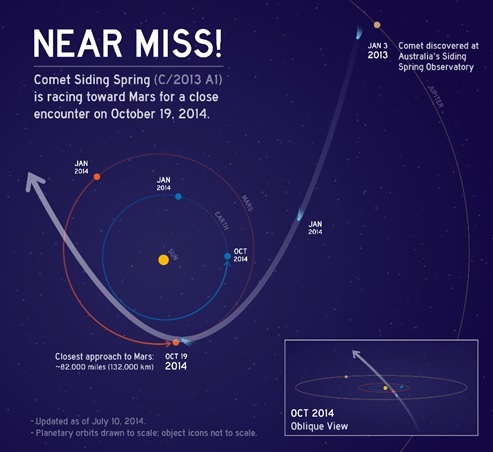 On Saturday Maven will be just 132,000 km away from the COMET Siding Spring. We see this as a “historic moment” in space exploration and the “search for life”. Perhaps even an opportunity to test one of the main propositions of Panspermia. 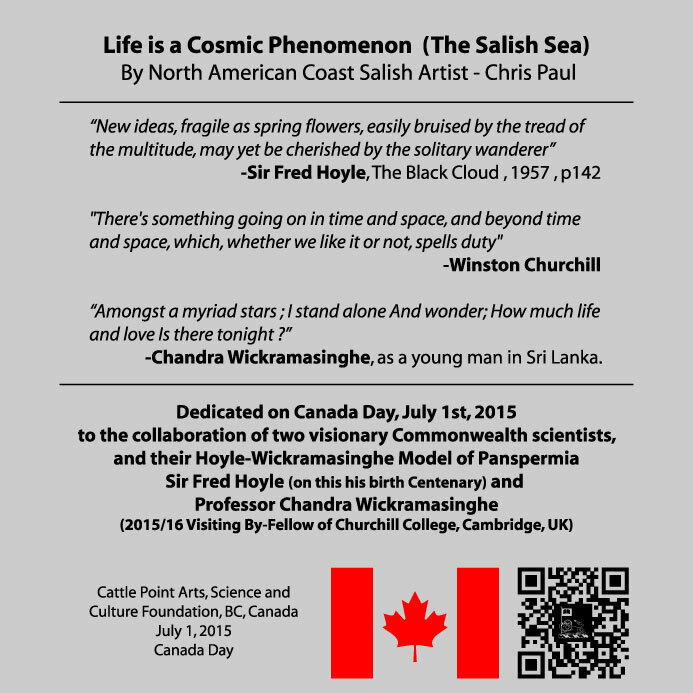 The Hoyle-Wickramasinghe Model of Panspermia hypothesized that long period Comets are the source of life in the solar system. 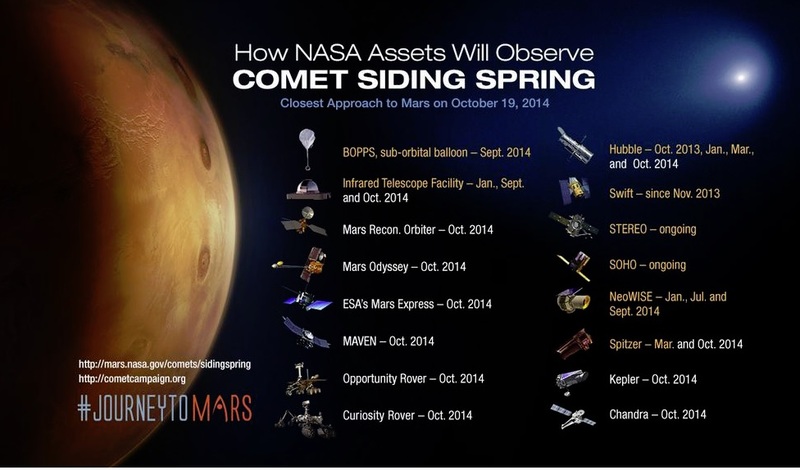 Maven’s observations of Comet Siding Spring could/should deliver the evidence consistent with this hypothesis. These would be momentus results in “NASA’s Difficult Endeavour of Seeking the Signs of Life”. COMET Siding Spring, whose source is at least as far as the very edge of our solar system, could be the first confirmation that Comets do indeed carry the “seeds of life”. It might be a long time before we are as close again as this to an Exocomet with such an array of powerful scientific capability pointing at the Comet. Our best wishes go out to the NASA teams of ALMA, HiRise and MAVEN, as you follow the new NASA directive to “follow the difficult endeavour of seeking the signs of life” in Comet Siding Spring. This could well be the paradigm changing moment.